Mario Tennis comes to the Wii U System! 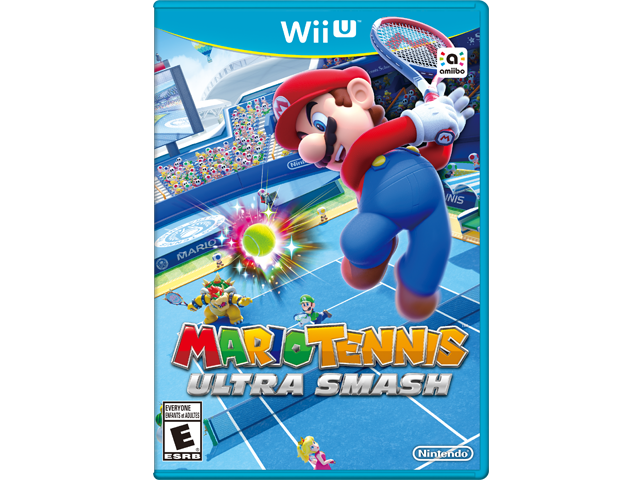 Compete with friends in the multiplayer Mario Tennis™: Ultra Smash game on the Wii U™ system. Along with the fun and dynamic gameplay known to the franchise, surprise your opponents with a new move to the series, the Jumpshot, which sends the ball flying down the court. Change the sport up with new Mega Battles, using the Mega Mushroom to gain an advantage over the competition. Claim your spot in Mario Tennis lore in singles (1v1) or doubles (2v2) as you play with and against family, friends or the CPU using returning and new characters to the series. Play against friends and family in multiplayer matches. Play against friends and family in both singles (1v1) and doubles (2v2) matches as your favorite Mushroom Kingdom character. Control your character’s every movement on the court, using precise timing and the correct shot to outwit your opponent. Use the new Jumpshot technique to return shots like never before. In Mega Battles, get the Mega Mushroom to gain a “big” advantage over your competition. New characters make their Mario Tennis debut.